It is a great joy for us brothers to see so many of you here this week. Already during the past two weeks, many French people came to the hill, but beforehand, during the winter, there were few pilgrims. Some weeks, the volunteers were even more numerous than the young visitors. And now, there are 2000 of you from Portugal and still others from elsewhere. Tomorrow we begin the season of Lent. What comes first to my mind when I think of those forty days of journey to Easter is the image of the desert, the one in which Jesus spent forty days of solitude, or the one where the people of God walked for forty years. 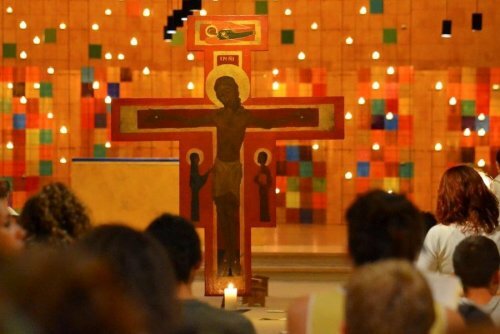 Brother Roger, who began the life of our community in Taizé, liked to remind us, when the weeks before Easter arrived, that it was not a time of austerity or sadness, nor a period to keep guilt alive, but a moment to sing the joy of forgiveness. He saw Lent as forty days to prepare to rediscover little springtimes in our lives. At the beginning of the Gospel of St. Mark, Jesus calls those who listen to him to a conversion: “Turn to God and believe in the gospel.” Yes, during Lent we would like to turn to God for his forgiveness. By his constant forgiveness, God allows us to renew an inner life. It is to a conversion that we are invited: not to turn towards ourselves in introspection, but to seek communion with God as well as communion with others. And the conversion to which we are invited also concerns the link that unites us to all creation. Wonder at creation leads us to a more respectful behavior towards our environment. Lent is a time of renunciation, of simplification. Not that asceticism has value in itself, but simplifying our way of life can help us discover our deepest longing, our thirst for the essential. You will experience it this week. Here you are living very simply, with few material things, and yet there is joy, and you discover that silence can do good. In this way you can deepen your faith, which is a simple trusting. As believers we do not follow an ideal; we follow a person, Christ. We are not alone; he goes before us. Following him entails an internal struggle, with decisions to be made, lifelong faithfulness. In this struggle, we do not rely on our own strength but we surrender to his presence. The road is not laid out in advance; it also involves welcoming surprises creating with the unexpected. And God does not tire of taking the path with us. We can believe that communion with him is possible and never get tired of always having to resume the struggle. We do not persevere in order to present ourselves to God at our best. No, we agree to move forward as poor people of the gospel who trust in God’s mercy. Lent is also a time that invites us to share. While he was in the desert, Jesus, moved with compassion for those who had followed him, multiplied five loaves and two fishes to feed everyone. What signs of sharing can we accomplish? Tomorrow we will have two signs during the prayer to mark this entry into Lent. The first sign is that of ashes. During morning prayer, the brothers will make a cross with ashes on the forehead for all who wish. In giving the ashes, the brothers will say to each person, “Turn to God and trust the gospel.” This is a very ancient gesture that calls us to humility. The ashes and the oil we receive tomorrow are two symbols that invite us to forgiveness and celebration. May this Lent be a time of joy for each and every one of us. The joy of forgiveness, the joy of reconciliation.